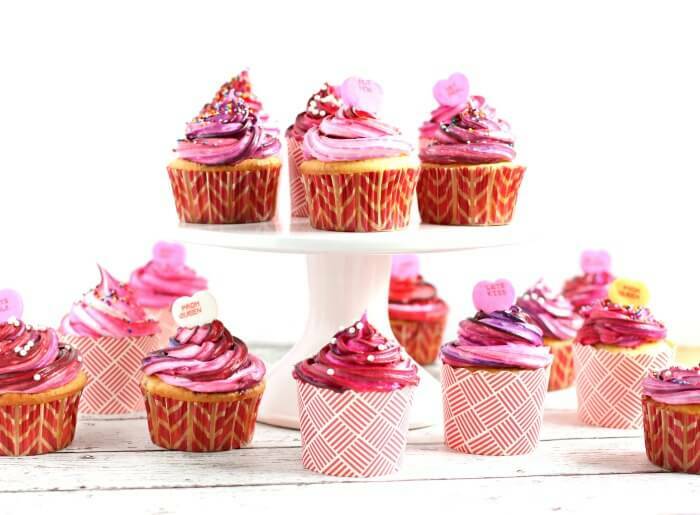 Valentine’s Cupcakes are a simple and delicious way to celebrate Valentine’s Day with your sweeties – you can even make these Valentine’s Day Cupcakes with the kids! 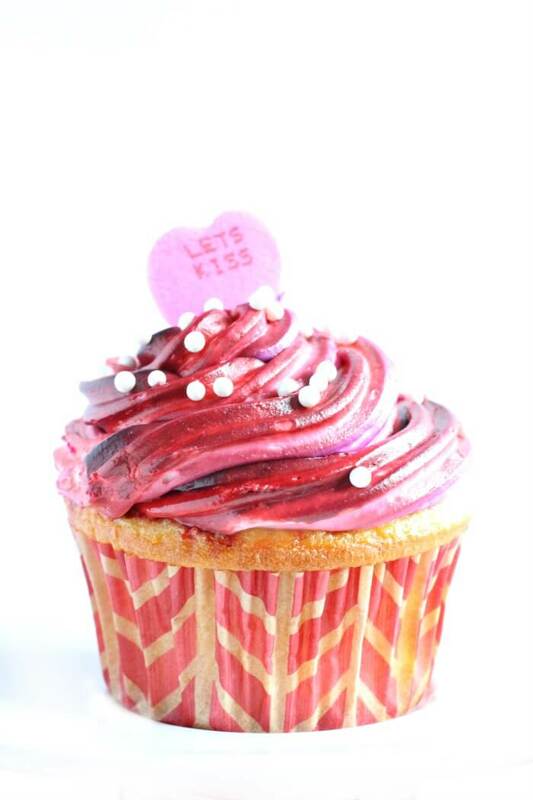 Our Valentine’s Cupcakes have a fun little icing trick to make the galaxy style swirled icing tops. I just love how they came out! For me, the best part of our Valentine’s Day Cupcakes is that they’re not all the same. We were inspired by the multicolored icing and embraced uniqueness. No two cupcakes are alike! I had so much fun making these Valentine’s cupcakes! I think it was especially enjoyable because we weren’t going for perfection. Some have sprinkles, some have hearts, and others a little bit of both. The eclectic look is great and it almost feels like the little imperfections were intentional. Going for a broadstrokes Valentine’s Cupcake feel rather than cookie cutter style, everyone’s the same cakes, also let me mix up our cupcake wrappers. I’ve been wanting to use them both for a while now, but haven’t had an excuse! The other great thing about making general themed cupcakes is that if you have the kiddos helping you, you don’t have to worry about them following exact directions. I don’t know about you, but I have a hard time not correcting my kids. If you make theses, there’s not corrections to be made! Are they pink, purple, red, or white? Yes! Do they have sprinkles or candy? Yes! Then they’re perfect! Don’t put the icing super thick in he bag. We were pretty heavy handed and not only was there plenty of color left in the bags when we were done, but a few of the cupcakes had wayyyyyy more coloring on them then necessary. It didn’t hurt them, but you do run a greater risk of staining all the things. If you don’t have time to make the cupcakes and decorate them at the same time, go ahead and bake up your cupcakes, then freeze them in a gallon bag. Whenever you’re ready to decorate, just pull them out and let them defrost on the counter top for a little while. 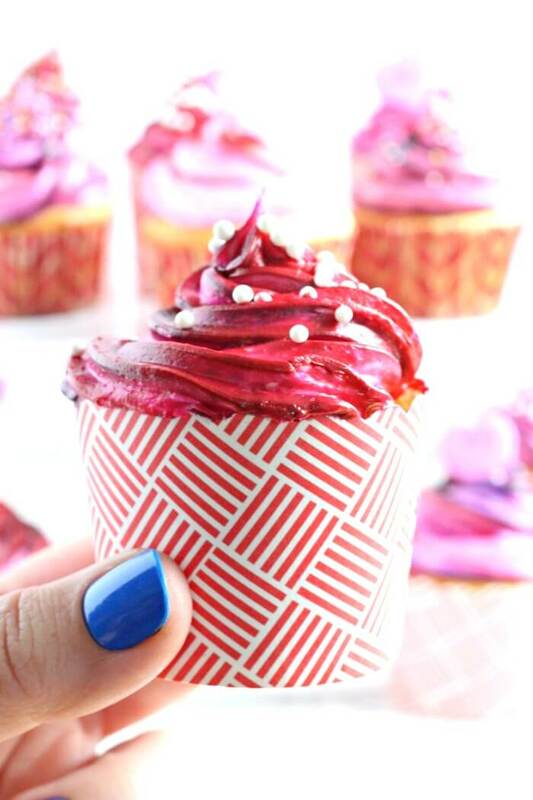 I actually like to keep a batch of cupcakes in my freezer all the time for impromptu guests! The icing will harden on the outside pretty quickly since we added extra powdered sugar (don’t worry, it doesn’t affect the flavor, they just won’t be sticky to the touch). This is important to note because you’ll need to put your sprinkles on right away if you want them to stick! Also, we used (my favorite!) 1m star piping tip for our Valentine’s Cupcakes – make sure to watch the video below for how to switch piping bags quickly and easily! 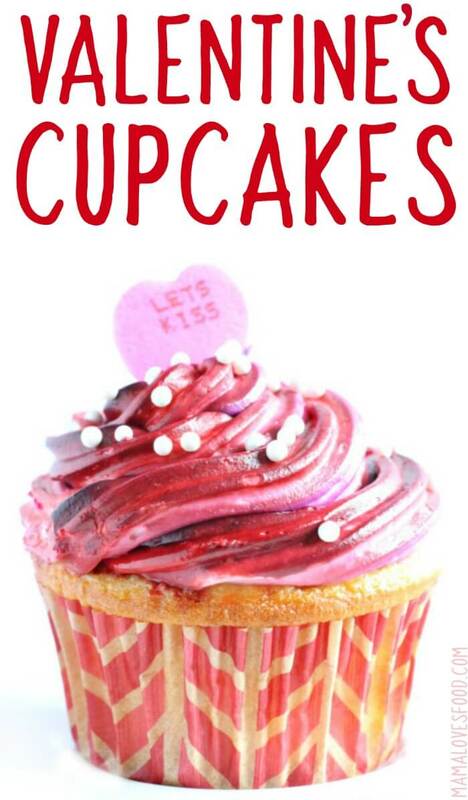 Check out our Amazon affiliate links for all your Valentine’s Cupcake baking needs! Wilton 12 Cup Muffin Pan – Can someone talk to the cupcake pan making people and tell them we want a pan that makes 18 cupcakes? That would be greeeeeat. In the meantime, two of these 12 cup bad boys will work just fine. 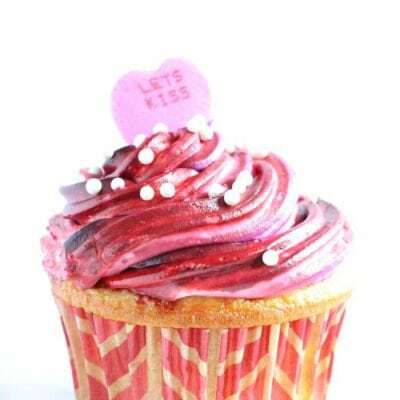 Valentine’s Cupcake Liners – These are the cup style ones you see me use in the cooking show video. They’re soooooo cute, and I love them a very very lot. 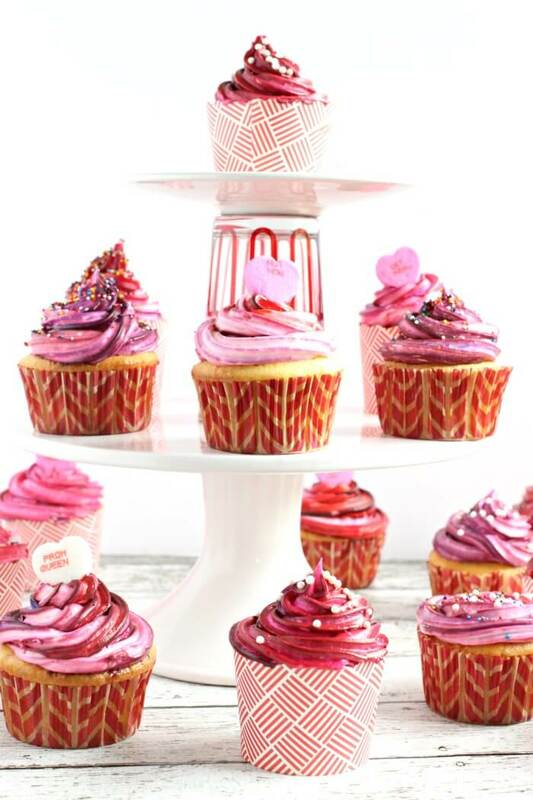 If you love these Valentine’s Cupcakes, make sure to check out our other yummy Valentine’s Day treat ideas! 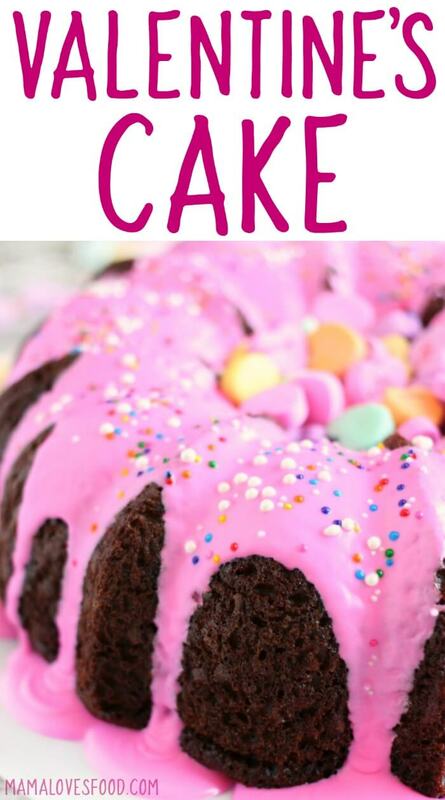 Valentine’s Cake Bundt Cake – The easiest way to make a pretty cake is to use the bundt cake pan! There is literally no such thing as an ugly bundt cake, and this super easy and totally gorgeous Valentine’s Cake proves that once again! Two Ingredient Strawberry Dark Chocolate Fudge – Did you know you could make fudge in the microwave?! My mother-in-law is the queen of delicious fudge and even she was fooled by our cheater fudge recipe. Make it strawberry and dark chocolate for Valentine’s Day! Flourless Dark Chocolate Mug Cake for Two – It’s technically meant for two, but sometimes I enjoy it with three. Me, Myself, and I. Hah! You’ll understand why when you make this Flourless Dark Chocolate Mug cake and don’t want to share. 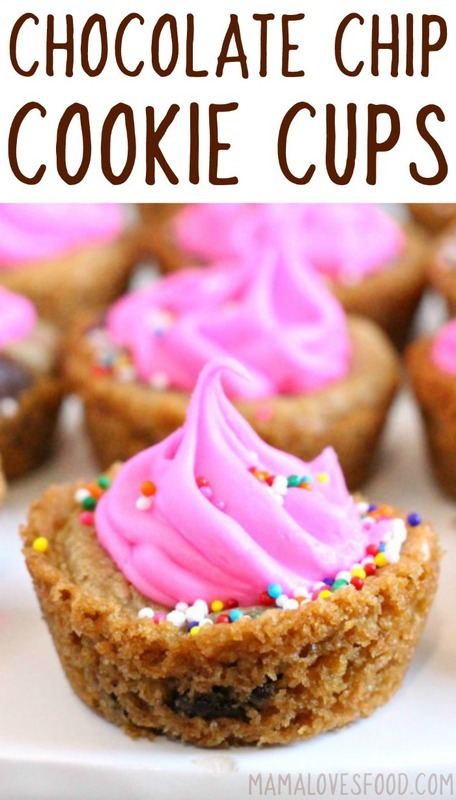 Chocolate Chip Cookie Cups – Start with premade cookie dough from your grocers refrigerated section, and you’ll have gorgeous chocolate chip cookie cups in no time. 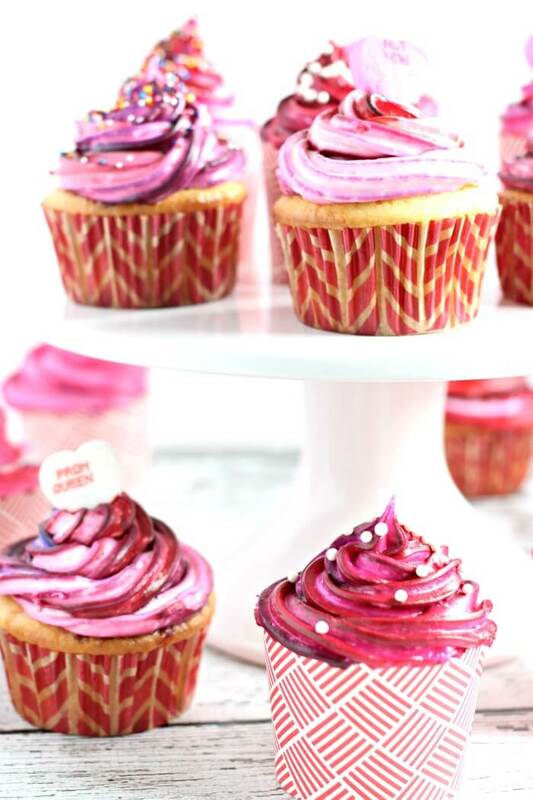 Choose the icing color according to your occasion (yay, pink for Valentine’s Day! ), and you’re all set! 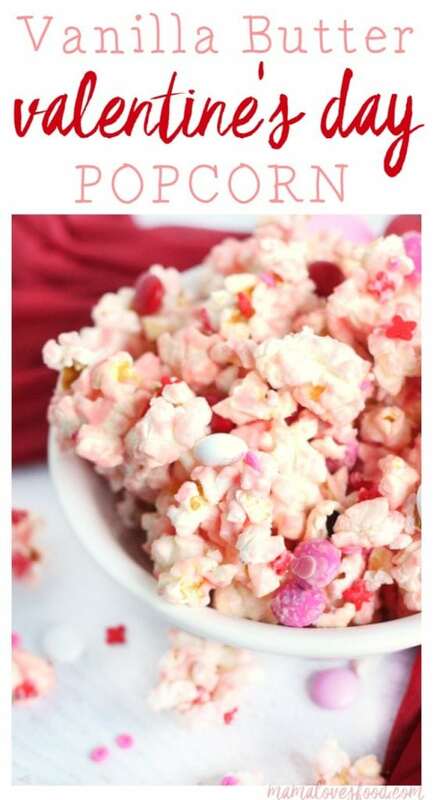 Vanilla Butter Valentine’s Popcorn – If sweet and salty make your mouth water, this Vanilla Butter Popcorn is going to make you so very very happy! It’s a favorite in our house, and we’re making it PINK to celebrate Valentine’s Day! You can also watch us make these Valentine’s Cupcakes on Youtube! Make sure to tune in for all our live cooking shows! Prepare cake batter with noted modifications (or not, whatever suits you), mix with an electric mixer or electric beaters. Stir in white chocolate chips. Fill cupcake liners halfway with batter. While cupcakes are baking, put icing in a bowl and beat powdered sugar into it. Set aside. Grab four piping bags (if you're using standard size bags), and with a clean paint brush, paint the gel food coloring on the inside of the bags - we used pink, purple, and red. I used a sponge brush in our video above, but I actually think a regular paintbrush or small basting brush would work better. Allow the food coloring to set for 5 - 10 minutes. When food coloring is set, add the white icing to the painted bags. When cupcakes are done baking, remove from pan and allow to cool completely. Pipe icing on top, then add sprinkles and conversation hearts. You'll want to add the sprinkles right away as the added powdered sugar will make the outside of the icing dry quickly. We used the 1m star piping tip for these. 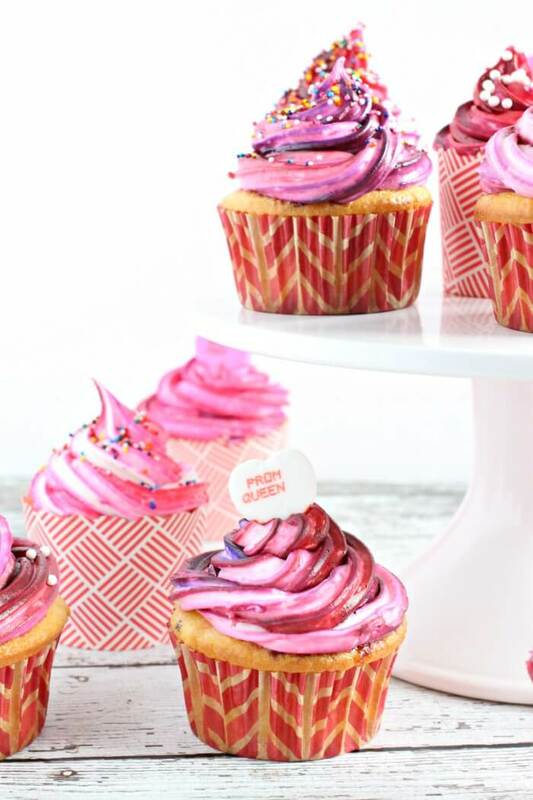 Grab four piping bags (if you’re using standard size bags), and with a clean paint brush, paint the gel food coloring on the inside of the bags – we used pink, purple, and red. I used a sponge brush in our video above, but I actually think a regular paintbrush or small basting brush would work better. Allow the food coloring to set for 5 – 10 minutes. When cupcakes are done baking, remove from pan and allow to cool completely. Pipe icing on top, then add sprinkles and conversation hearts. You’ll want to add the sprinkles right away as the added powdered sugar will make the outside of the icing dry quickly. 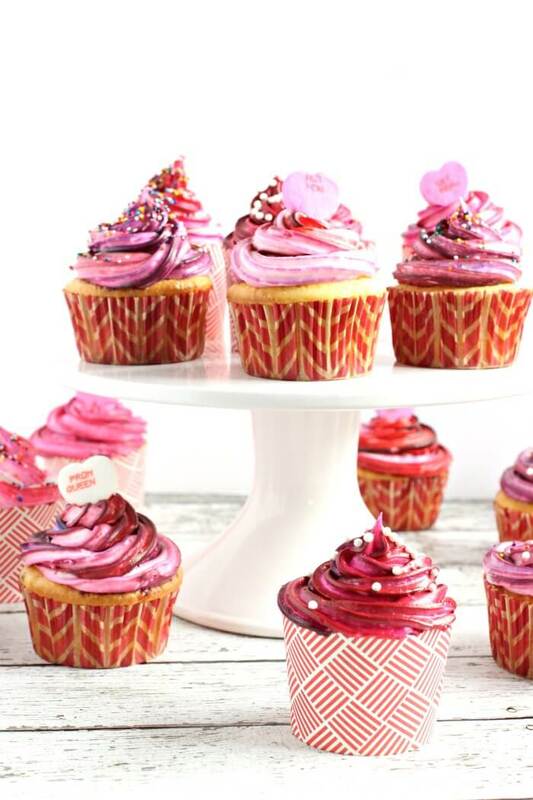 These cupcakes are gorgeous and perfect for a Valentine’s Day party! I love your cupcake tips, too! This is so helpful. There’s nothing better than sitting down with a bunch of fun sprinkles and icing and having a Valentine’s Day decorating session. Great ideas…I’m totally inspired!